or . 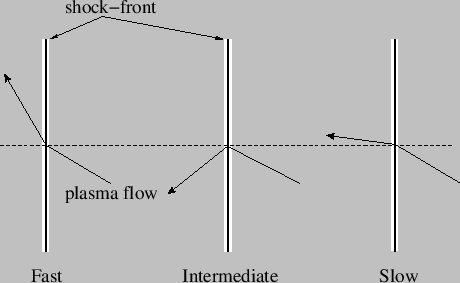 Thus, in the de Hoffmann-Teller frame, the upstream plasma flow is parallel to the upstream magnetic field, and the downstream plasma flow is also parallel to the downstream magnetic field. Furthermore, the magnetic contribution to the jump condition (7.255) becomes identically zero, which is a considerable simplification. As before, the second law of thermodynamics mandates that . In other words, a fast wave travels faster than an intermediate wave, which travels faster than a slow wave. It is reasonable to suppose that the same is true of the associated MHD shocks, at least at relatively low shock strength. It follows from Equation (7.282) that for a fast shock, whereas for a slow shock. For the case of an intermediate shock, we can show, after a little algebra, that in the limit . We conclude that (in the de Hoffmann-Teller frame) fast shocks refract the magnetic field and plasma flow (recall that they are parallel in our adopted frame of the reference) away from the normal to the shock front, whereas slow shocks refract these quantities toward the normal. Moreover, the tangential magnetic field and plasma flow generally reverse across an intermediate shock front. This is illustrated in Figure 7.12. Figure 7.12: Characteristic plasma flow patterns across the three different types of MHD shock in the de Hoffmann-Teller frame. When is slightly larger than unity, it is easily demonstrated that the conditions for the existence of a slow, intermediate, and fast shock are , , and , respectively. There are no other real roots. The previous root is clearly a type of fast shock. The fact that there is only one real root suggests that there exists a critical shock strength above which the slow and intermediate shock solutions cease to exist. In fact, they merge and annihilate one another (Gurnett and Bhattacharjee 2005). In other words, there is a limit to the strength of a slow or an intermediate shock. On the other hand, there is no limit to the strength of a fast shock. Note, however, that the plasma density and tangential magnetic field cannot be compressed by more than a factor by any type of MHD shock. We recognize the first of these roots as the hydrodynamic shock discussed in Section 7.19 [see Equation (7.260)]. This shock is classified as a slow shock when , and as a fast shock when . The other two roots are identical, and correspond to shocks that propagate at the velocity and ``switch-on" the tangential components of the plasma flow and the magnetic field: that is, it can be seen from Equations (7.282) and (7.284) that while and for these types of shock. Incidentally, it is also possible to have a ``switch-off'' shock that eliminates the tangential components of the plasma flow and the magnetic field. According to Equations (7.282) and (7.284), such a shock propagates at the velocity . Switch-on and switch-off shocks are illustrated in Figure 7.13. 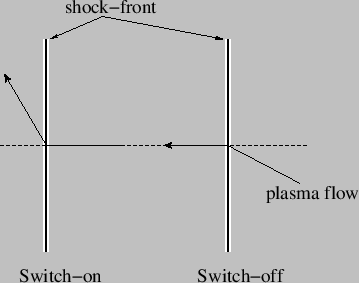 Figure 7.13: Characteristic plasma flow patterns across switch-on and switch-off shocks in the de Hoffmann-Teller frame. The first of these roots is clearly a fast shock, and is identical to the perpendicular shock discussed in Section 7.20, except that there is no plasma flow across the shock front in this case. The fact that the two other roots are zero indicates that, like the corresponding MHD waves, slow and intermediate MHD shocks do not propagate perpendicular to the magnetic field. MHD shocks have been observed in a large variety of situations. For instance, shocks are known to be formed by supernova explosions, by strong stellar winds, by solar flares, and by the solar wind upstream of planetary magnetospheres (Gurnett and Bhattacharjee 2005).